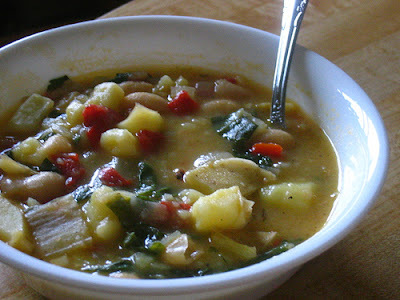 Last week I promised a recipe that would use swiss chard, and I'm fulfilling that promise with one of the best soup recipes I've found in a long time. This dish will give you yet another way to include more leafy green vegetables in your diet and thus benefit from their high vitamin, mineral and antioxidant content. And not only does this soup recipe pass the five easy questions test with flying colors, it also qualifies for laughably cheap. Saute the onions and garlic in oil for 4-5 minutes in a large soup pot. 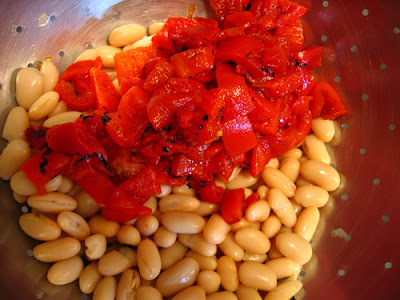 Add water, potatoes and black pepper, bring to a boil, then simmer for 20-25 minutes, stirring occasionally. 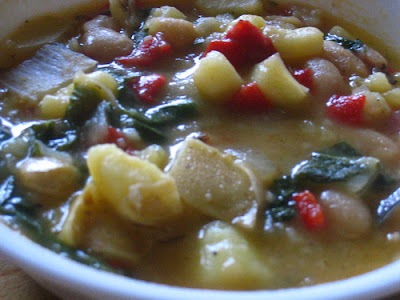 Stir in the kale (or swiss chard), beans, roasted red peppers and parsley, simmer for 10 minutes more. Turn off heat and let stand for 10 minutes more. You can mash some of the potatoes against the side of the pot to make a thicker soup. Serve immediately. Serves 5-6, and can be doubled easily. 1) You'll recall in our last post on swiss chard, I said to chop up and include the stems. 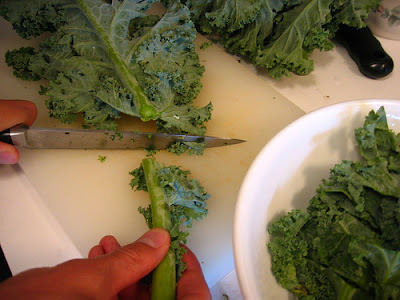 However, if you use kale, as I am in the pictures in today's post, I suggest you cut the stems off. Swiss chard stems are mild and tasty, but kale stems are quite thick and tough. Thus with kale, just stick with the leaves. 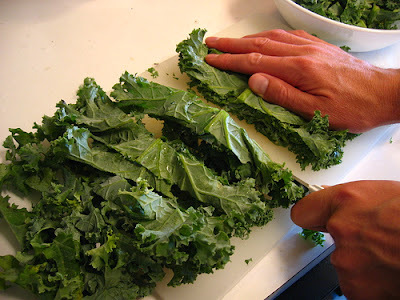 2) Just as with swiss chard, the prep work goes a lot faster if you stack the leaves like in the picture below. Cut them in 1-2 inch strips, then cut them again once or twice crosswise. You'll reduce these guys to bite-sized pieces in no time at all. 3) Finally, recall our suggestions in prior posts about including wine with any meal, for purposes both gustatory and analgesic. 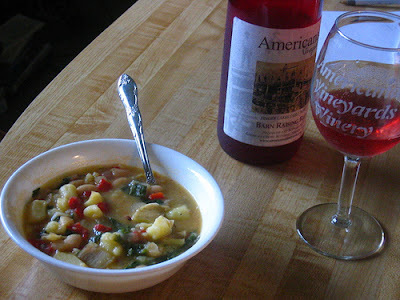 Today's dinner was accompanied by an unpretentious semi-sweet wine we bought a few weeks ago at Americana Vineyards called Barn Raisin' Red. If you're ever visiting Ithaca, NY or the general area of upstate New York's Finger Lakes region, I highly recommend checking this winery out. Glutathione is an antioxidants that protect our cell from free radicals. And since are skin are made of cells, then this gives us a healthier skin. Glutathione is the body’s primary defense against mercury, toxic metals, and many toxic chemicals, so a low level of glutathione results in a higher body burden of toxins.